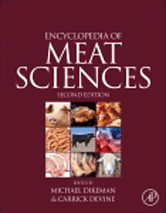 Editors: Devine, C. and Dikeman, M.
This encyclopedia covers the core theories, methods, and techniques employed by meat scientists and their related applications currently used in research and industry. MICROBIOLOGICAL SAFETY OF MEAT | Aeromonas spp. MICROBIOLOGICAL SAFETY OF MEAT | Salmonella spp. STUNNING AND KILLING OF FARMED FISH: HOW TO PUT IT INTO PRACTICE?